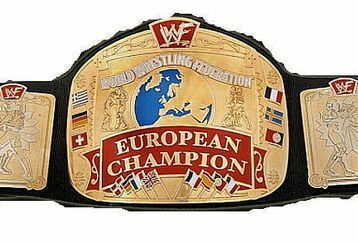 This is the fictional history of the WWF European Title as it relates to the holodeck program of Worf, Wesley, Will Riker, and Tasha Yar. Some reigns are not counted due to the belt being hotshotted the same night. The title is currently defunct and has the shortest real title history of all the titles. Sixty four men have won the European title. D'Lo Brown holds the record for most reigns with six and most cumulative days as champion. Pete Dunne holds the record for longest individual reign.